President and CEO William Considine presents the 2016 Distinguished Service Award to Charlene Maxen. In 1975 when Charlene (Char) Maxen started working at Akron Children’s as a staff nurse things were a little different. There wasn’t a single parking deck. Akron Children’s Hospital Pediatrics (ACHP) didn’t exist. There was, however, a tennis court right in the middle of Perkins Park where she witnessed more than a few epic battles among her coworkers. Back then Char didn’t know that the hospital would one day grow to become the region’s premier pediatric hospital, or that 42 years later she would become an indelible part of the Akron Children’s legacy. 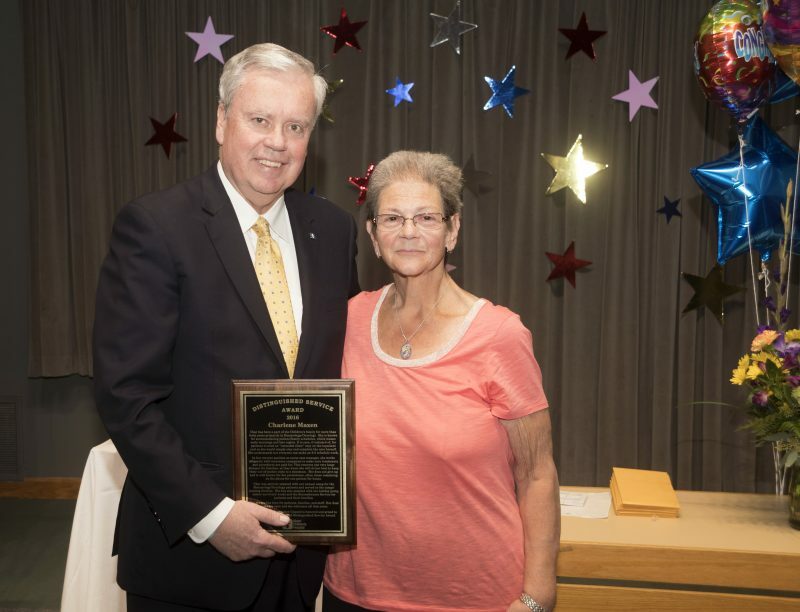 On January 25, Char joined an elite group when she was chosen by her peers as the hospital’s 2016 Distinguished Service Award (DSA) recipient. After spending 17 years as a staff nurse, float nurse and nurse practitioner, Char found a forever home on the hematology/oncology unit where she has worked for the last 25 years. As a case manager, she helps arrange home care, prior authorizations, coordinates discharges and patient transfers, and works with outside agencies and other support services. Working at Children’s has been a family affair for the Maxens. Char’s 2 sons and daughter-in-law have worked here and her husband, Jim, and dog, Tequila, were part of the Doggie Brigade for 7 years. “Jim came up with the idea to make a trading card of Tequila to leave behind with the patients we visited,” she said. “I remember one little boy who was so delighted he was sure the trading card would be worth something someday. Char says Drs. Carl Krill Jr., Alex Koufos, Mohammad Talai and Jeffrey Hord with teaching her a lot through the years. One of Char’s job duties is working with insurance companies to confirm treatments and procedures are covered and paid for at the best possible rate – removing one very large stressor for families. In 2005 Char experienced what is was like to be a patient instead of a caregiver when she was diagnosed with endometrial cancer. She says the experience helped make her better at her job. That strength was something she would draw upon again 10 years later. In 2015 she tragically lost both of her sons and battled a cancer recurrence. Char says it was her coworkers who helped get her through the darkest time in her life. Today Char is thankful to be cancer-free and enjoys spending time with her husband at their condo in Sandusky on the weekends.